When the Florida Panthers announced earlier in the offseason that they’d be making changes to the front office, one of the more interesting changes came in the way the team was going to be evaluating draft-eligible prospects. The changes signaled a boost in responsibility for the ‘ Money Puck’ guys, Cam Lawrence and Josh Weissbock. Lawrence and his evaluation model were at the Panthers draft table this past June. The shift in organizational philosophy won’t be seen for a few years but knowing of the changes, it will be interesting to track the prospects coming out of the 2016 draft. For the first time in the past four years, the Panthers didn’t have a pick in the top half of the first round. The selection of Henrik Borgstrom at #23 might have seemed a little off the board – he was ranked in the 2nd or 3rd round by most scouting services – but in a draft that was seen as a jumble from about the 12th pick on, the team can’t be faulted for selecting the player they felt was the best available. With that, let’s take a look at the entire Panthers prospect pool. The thing about the Panthers’ forward groups is that they could have the worst prospect in the league and it would be ok since they have Barkov, Huberdeau, Bjugstad and Trocheck all 23-years old or younger and all established as top-6 NHL forwards. 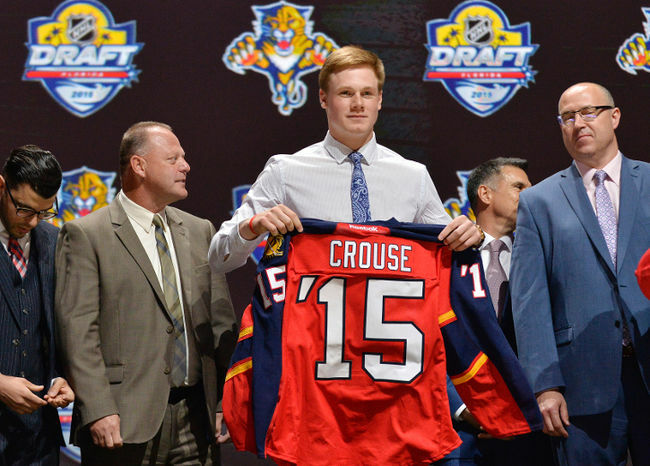 Last season, Lawson Crouse and Jayce Hawryluk were far and away the Panthers’ best forward prospects. In the past few months, the team added a lot of high-end talent around him. Signing Hunt and trading for McCann, Florida added two pieces that could very easily step into the NHL lineup next season. In this year’s draft, the Panthers may have reached a bit for their first round pick, but later in the draft they were able to pick up two OHLers that I was very high on and probably could have been selected higher than they were. Adam Mascherin is a very talented offensive player that is small-ish forward that doesn’t play with the quickness you see from most players his size but he has great offensive instincts that help make up for that. He’s not the greatest skater, so that will have to be improved, but if he can improve over the next two years he could be a very good secondary scoring option at the next level. Jonathan Ang is the one that could be a true diamond in the rough. Watching him in Peterborough this season, Ang is a player that with proper development and a bit of an attitude change could be a very good NHLer. Ang was probably the second fastest skater in the OHL last season – after New Jersey first rounder Michael McLeod – and he has puck skills that you’d see from a player in the first two rounds. The reason he fell to the fourth round is that Ang is a perimeter player. He shies away from contact and when the puck isn’t on his stick he’s reluctant to stick his nose into the play. If the organization is able to change the way Ang thinks about dealing with more physical play, they could have a steal on their hands. Like with the forwards, with the age and skill of the defenders already in the NHL, the fact that the Panthers don’t have the best group of defense prospects isn’t a huge deal. Weeger looks like he has the potential to be a regular NHLer, which is very nice coming from a guy who was drafted in the 7th round. He and McCoshen should form a very nice tandem in the AHL this season that will likely be a year away from being NHL callups. I am a huge fan of the Riley Stillman selection in this year’s draft – and not only because I saw most of his home games in Oshawa this season. Stillman had a great rookie year with the Generals and grew exponentially as the season went on. With veterans being traded away, Stillman’s role in Oshawa grew and he was able to thrive playing in every position. He’s a smart player that has the skill set to be a very good second pairing NHL defender. Evan Cowley and Samuel Montembeault are the two guys that will be battling over the next few years to be the air apparent to Roberto Luongo. Both are highly talented prospects but have a long way to go and will likely be in the AHL for a number of years before being NHL ready. With Ryan Bednard, Colin Stevens and Hugo Fagerblom also in the organization as depth pieces, the Panthers have plenty of young goaltending to develop.